Anyways, we are here to help you understand and choose what you exactly want. So here’s the list of simple, clean and minimal WordPress themes that are proven to create a website with professional look and feel. Flash is a simple looking yet feature-rich multipurpose WordPress theme. It is an advance responsive theme that helps you to create a professional looking site. This theme is not just beautiful by its design but is powerful by its easy to use pool of features as well. Flash theme is the best choice for the people who love a simple and clean design with a great functionality. It provides such features which are a little hard to believe that a free theme offers. Above all, it currently empowers 8000+ sites. 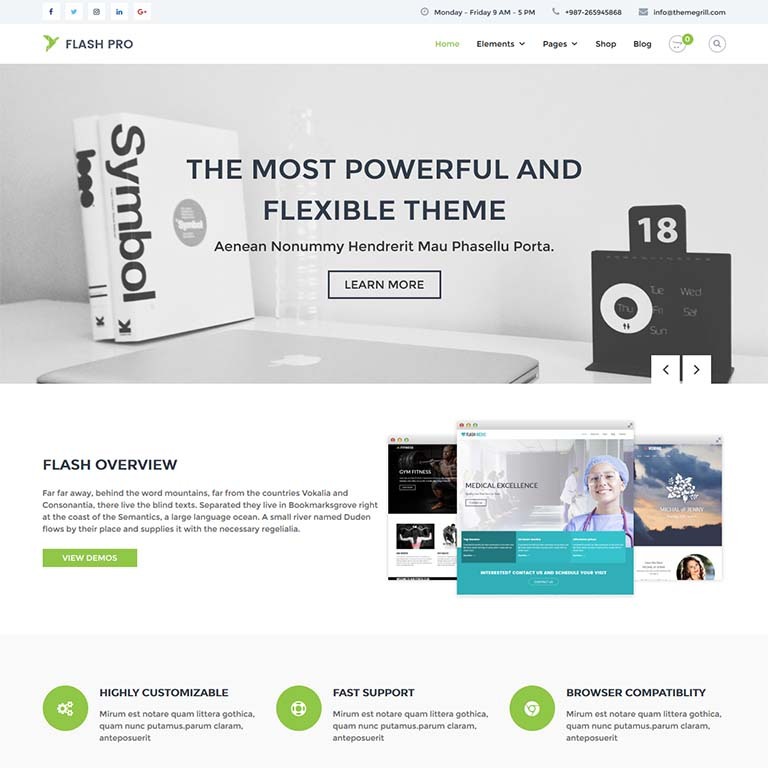 As a result, Flash is the most popular multipurpose WordPress theme at WordPress.org for 2019. 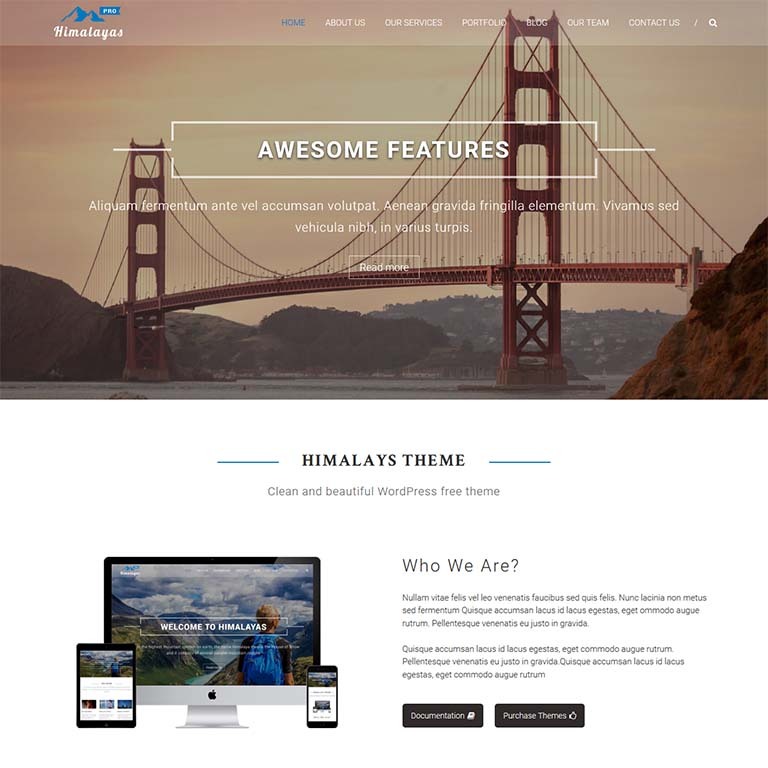 Himalayas is a modern style free responsive WordPress theme. It is a one-page parallax theme which can be a perfect choice for creating a clean and beautiful website. This theme provides the user with all the required information from the home page. For this reason, one-page happens to be one of the most loved features of this theme. Himalayas is a multipurpose WordPress theme. Thus, it can be used to create business, portfolio, photography, magazines, corporate, and almost all kinds of websites. Also, it is compatible with all kinds of browsers. Himalayas is just an epitome of such themes. You can also check out the list of one-page parallax themes. Hestia is a fully responsive WordPress theme for creating a professional website that fits business of any scale. This theme comes with a strong modern design and has its functionality on point. It is compatible with flat parallax slider, Elementor page builder, and photo gallery. This theme supports both multi-page and single page website designs. It is based on Google’s Material Design and comes with many valuable features such as custom backgrounds, parallax scrolling, widgetized footer, featured header slider, and full-width templates. 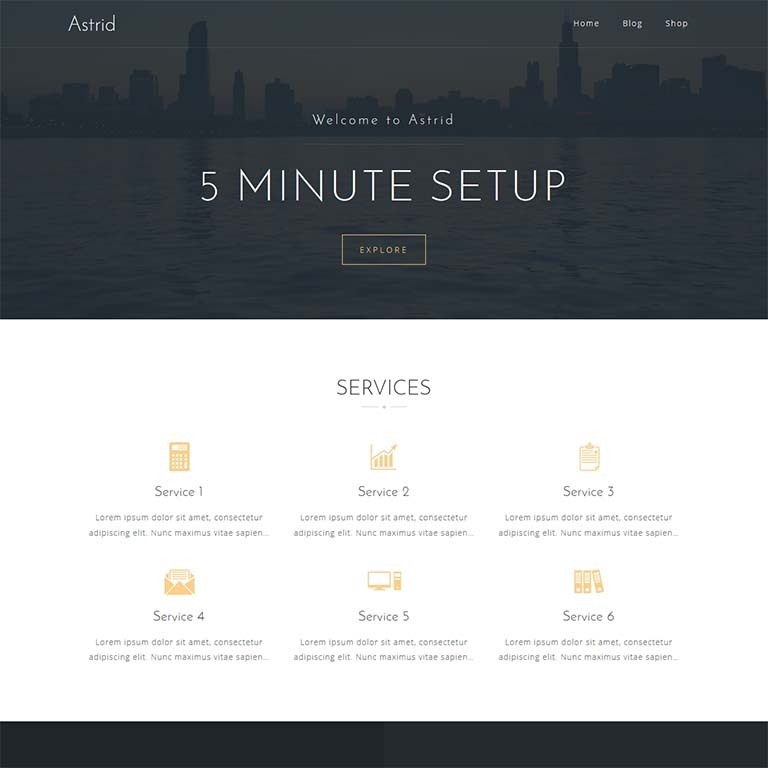 Astrid is a responsive business theme which helps you to create an outstanding website in no time. This theme provides a sleek and modern look to the websites. Moreover, it is incredibly easy to setup and customize. Be it color options, custom widgets, Google fonts or full-width header, this theme is not short on features. In short, it is packed with all the useful and interesting features. 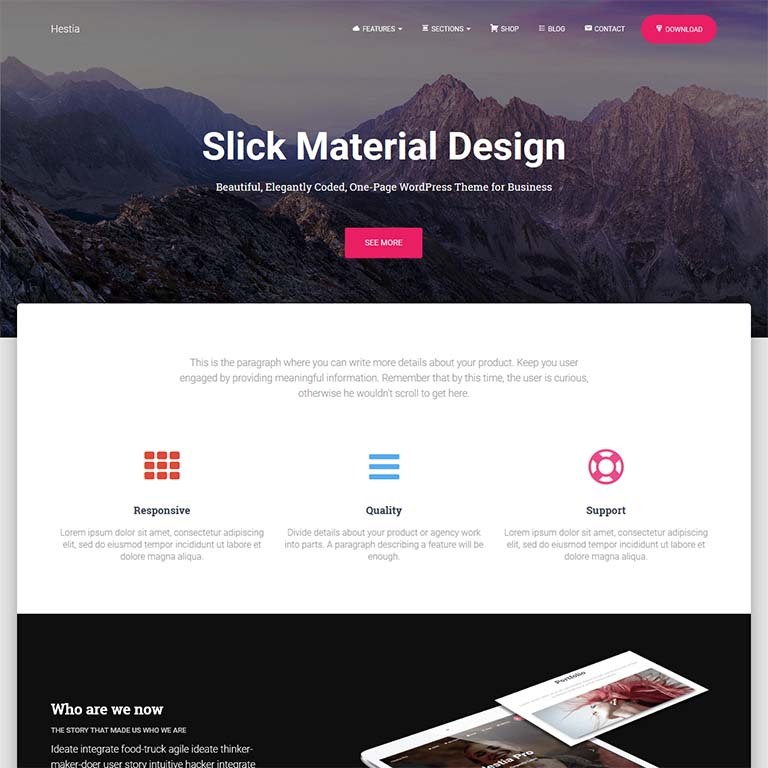 This theme provides a whole lot of functions to help you become more creative and build great responsive & professional designs. Hence, creating a modern, fresh and riveting business website is a no big deal with Astrid. 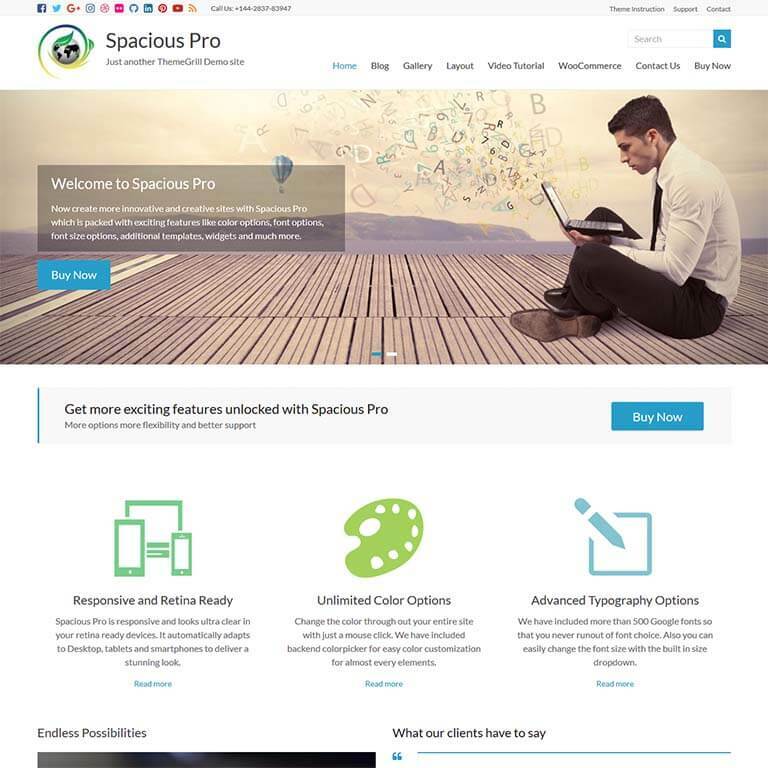 Spacious is a beautifully crafted multipurpose WordPress theme. It can be used for any kind of business websites including portfolio, blogging, product showcase and much more. Responsive design and super-fast loading time make it one of the highly-rated WordPress themes. As its name, this theme is incredibly spacious with 13 widgets areas. Spacious features a wide range of options along with 4-page layouts, 2-page templates, 4 blog display types, and 5 custom widgets. 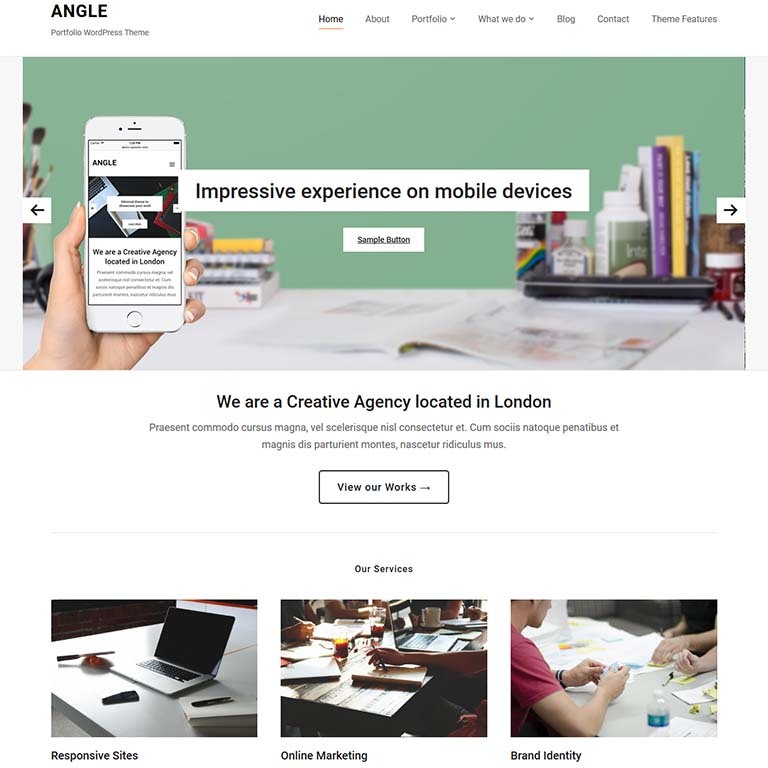 Angle is a minimal but highly functional portfolio WordPress theme. It uses advanced CSS techniques built on the latest Bootstrap framework. Thus it can also be defined as an ultimate flat Bootstrap WordPress theme. It is fully responsive, multi-purpose and ultra-flexible. 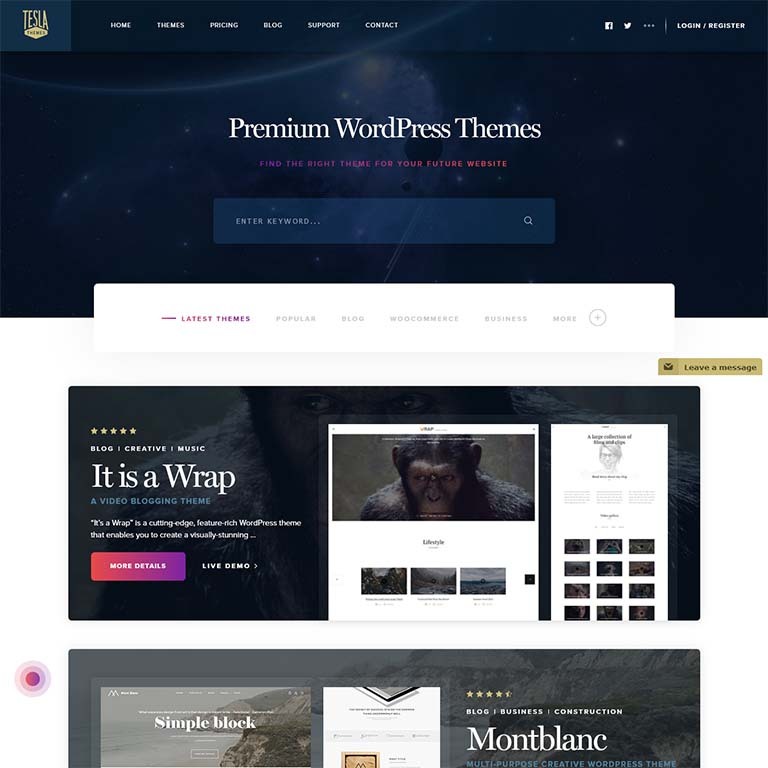 This theme is full of incredible features so that you can use it for your business sites, portfolios, blogging or any type of sites. 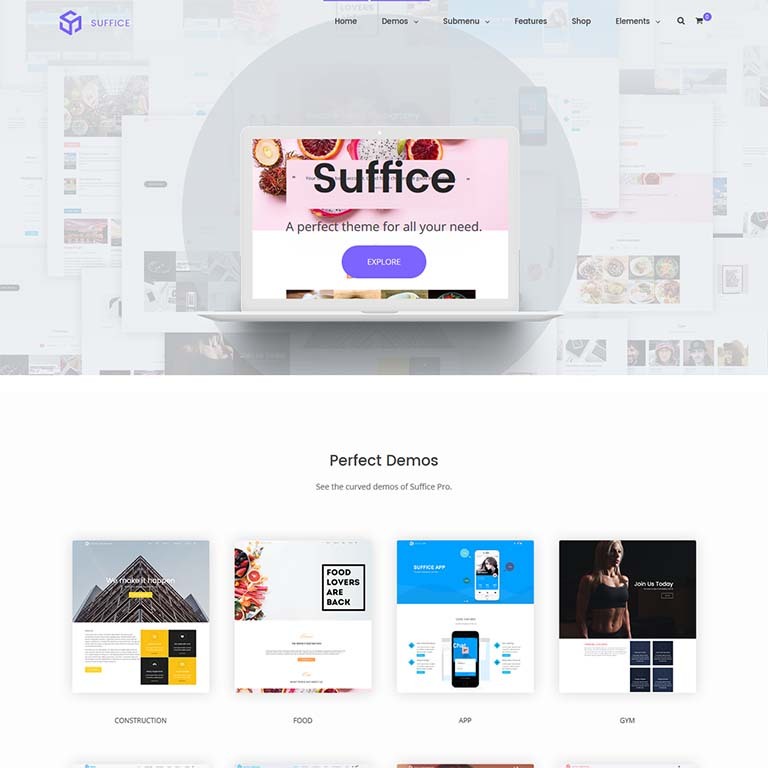 Suffice is a fully-responsive, super flexible yet simple WordPress theme by ThemeGrill. It offers a galore of incredible features to make your website stand out. The quality of support is one of the greatest features of this theme. Suffice is the perfect choice for the people with minimal programming knowledge. With this feature-rich advanced theme, you can just drag, drop and arrange the elements in the widgetized areas. Suffice is one of the best themes one has ever used, probably the best of all. 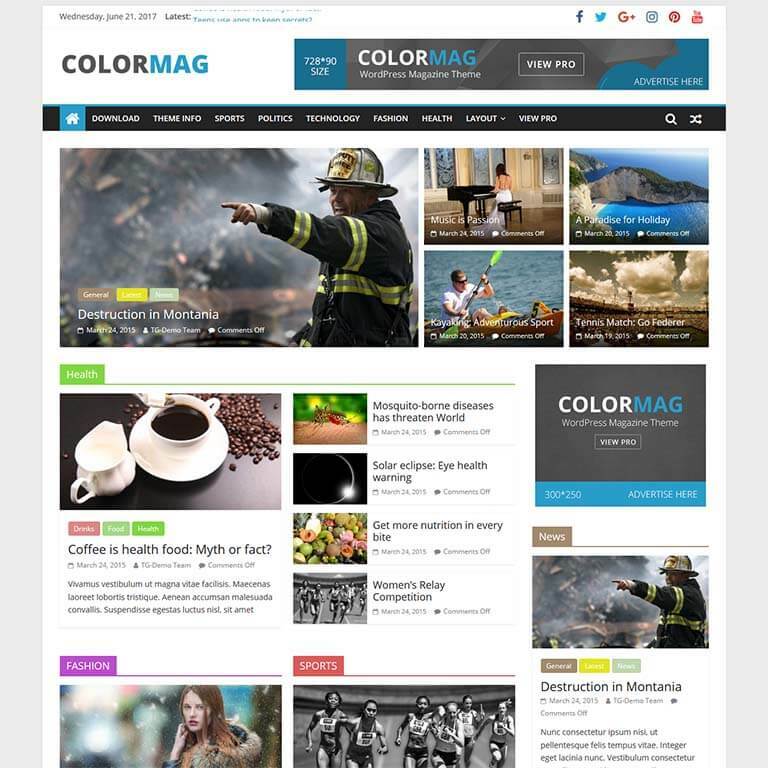 ColorMag is basically a magazine-style WordPress theme. However it is not limited to online magazines, newspapers, and other publications. This theme can also be used for other purposes. It is designed in such a way that you need not a single line of code to customize the look you site. This theme consists of 15+ widget areas and 6+ custom widgets for creating a professional looking magazine site. ColorMag is also optimized for speed and fully compatible with WPML plugin. 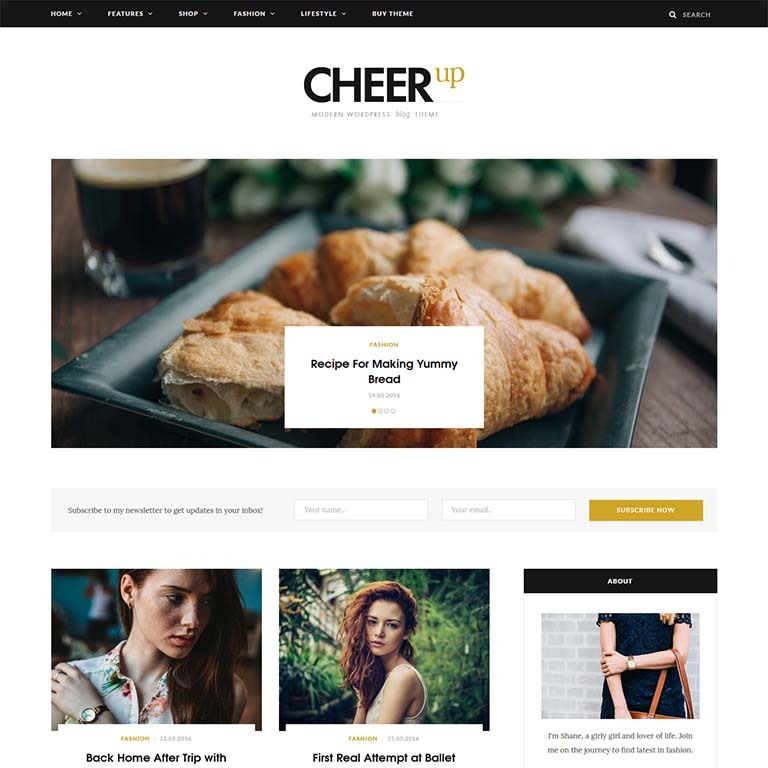 CheerUp is a responsive and clean WordPress theme. It is the theme with expressive, modern, elegant and luxury design options. CheerUp is suitable for all kinds of blogs and minimal magazines. This theme offers over hundreds of different layout style combinations to layout your website/ blog. And so, you can get rid of those gauche website/blog layouts now. It is a perfect theme for creating a blog with utmost elegance and ultra -flexibility. All code is hand-optimized in this theme. Thus, it is lightweight and guarantees high performance. The best part of this theme is that it provides free updates for life. 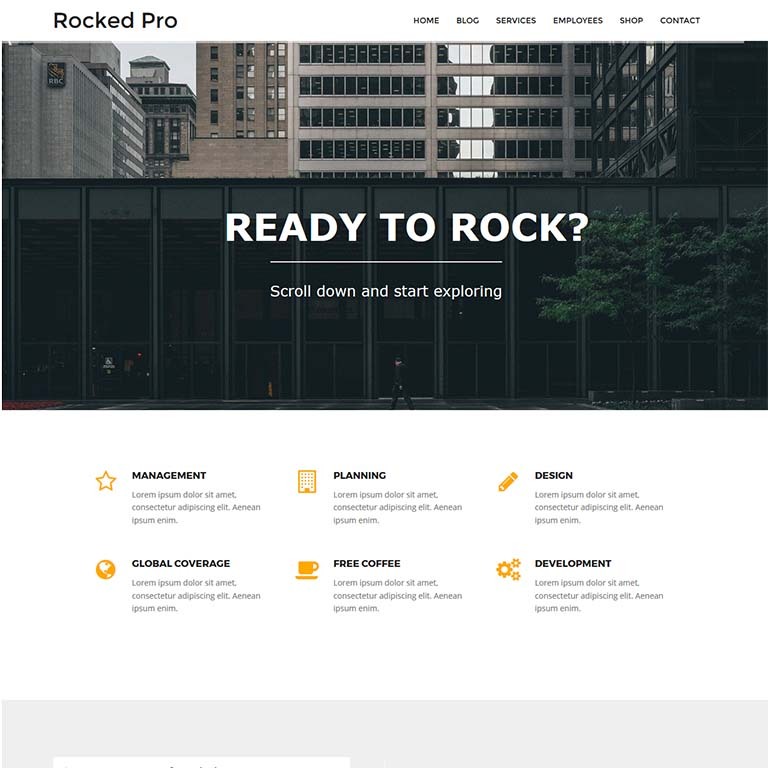 Rocked is an eloquent and clean WordPress theme presented by aThemes. It is one of the best WordPress themes for creating a corporate or business website. This responsive and modern WordPress theme is laden with all the interactive elements. It supports parallax scrolling, progress bars, animations, counting stats and many other features. Rocked offers a wide range of customization options and let you have the complete control over your website design. Some of the options are color control, logo and favicon upload, font options and predefined blocks. And the customization option is not limited to these options. You can also add your own custom code if the outcome is not as expected. 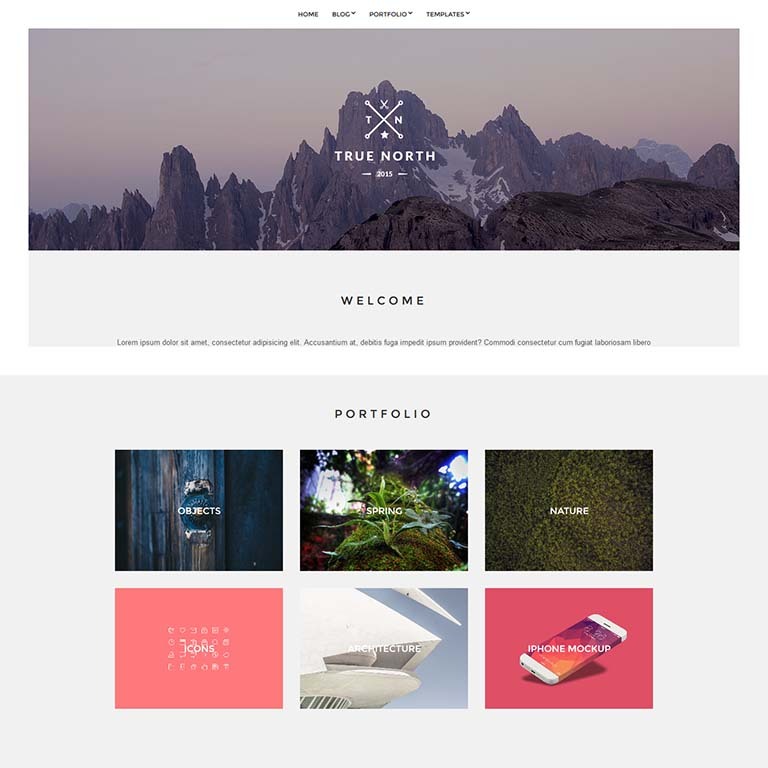 True North is a freemium portfolio theme for WordPress by CSSIgniter developer club. Freemium in a sense that it is a free theme but has all the features of premium theme included. This theme is perfect for easily showcasing your work and thoughts. This theme is guaranteed to promote your work by displaying your creativity in the most elegant way possible. True North comes with prodigious option panel and unique portfolio layout designs making it a powerful WordPress theme. Customizing this theme is so easy that you don’t need any prior web designing experience. With this theme, it is a breeze to customize the header, background, layouts, typography, sidebar and so on. 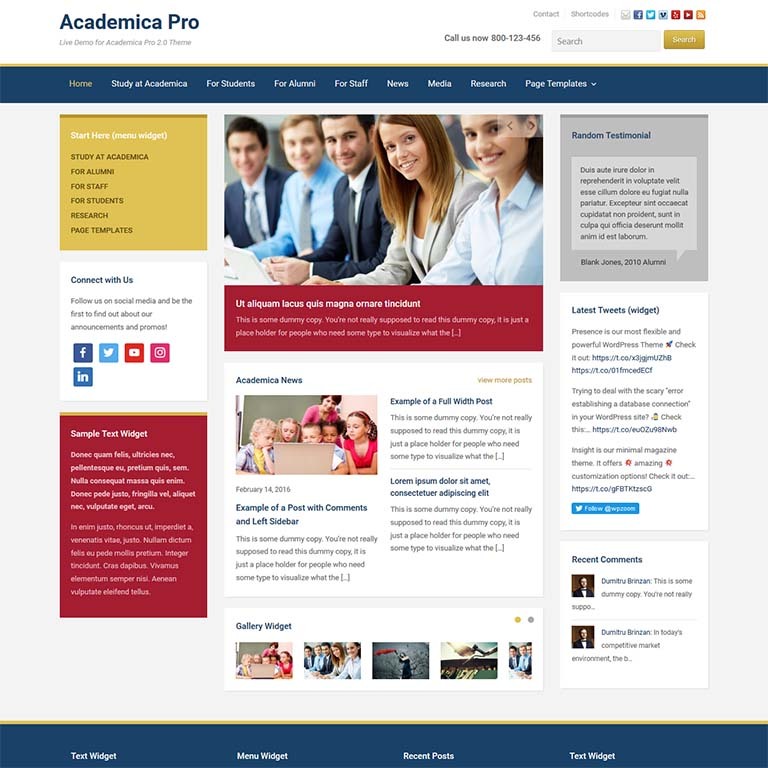 Academia is a professional and responsive WordPress theme for educational institutes. This theme specializes in the multi-variations educational website. Not just for schools, colleges, and universities, Academia is also suitable for creating websites for nonprofit organizations as well as online courses. This is the best educational WordPress theme to represent your institute and courses in a professional manner. This theme is built with using latest HTML5 and CSS3 web standards. Academia has a stunning user interface with 5 homepage variations, mega headers/ footer menus, powerful theme options and many other advanced features. Drag and Drop page building without coding. Daisy is an easy to setup simple WordPress theme apposite for personal blogs. It is fully responsive and has a very clean and sleek design. This theme is very simple which helps you setup your blog effortlessly. Daisy is built with amazing features and smart customization options. It offers 15+ blog layouts with multiple post formats and header styles. This theme supports 500+ Google fonts which makes it easy for you to customize your fonts, sizes, colors, etcetera, easily. 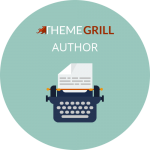 This is one of the best themes to build a blog site within minimal time frame. 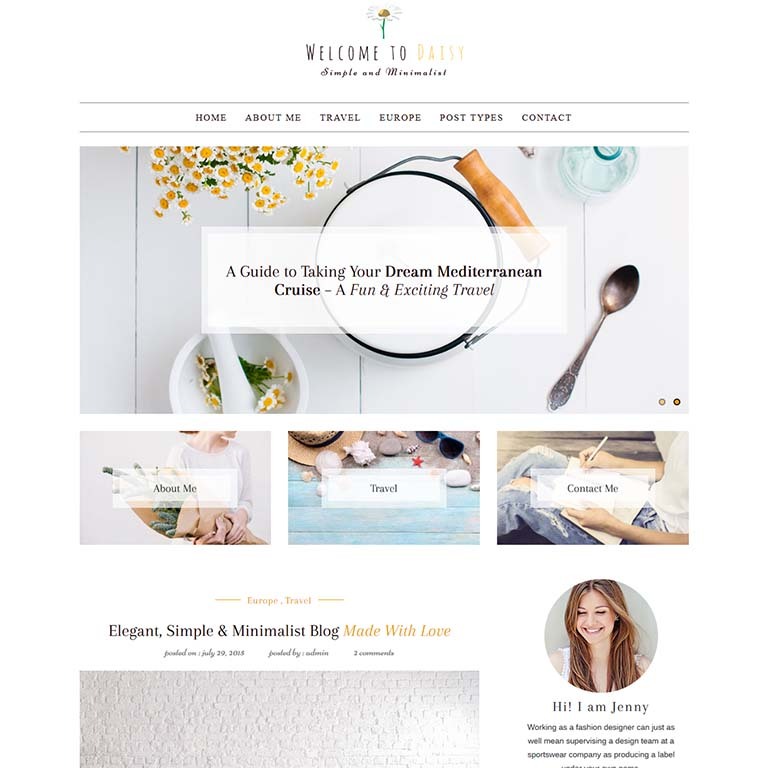 This theme is perfect for someone who own a craft business and is looking for a suitable website. Beatrix is creative super flexible responsive premium WordPress theme. This theme integrates visual composer drag and drop plugin so you can easily create a stunning website without a single line of code. Beatrix consists of user-friendly layouts and wide range of amazing elements which helps you get your own website up and running in no time. Its exquisite design fits in all kinds of stores like digital store, clothing store and many others. This theme perfectly fit projects of any size and complexity. Construction is premium business theme designed especially for companies providing construction and building services. This responsive WordPress theme is also suitable for renovation companies, architectural firms, freelance architects and any other similar purposes. 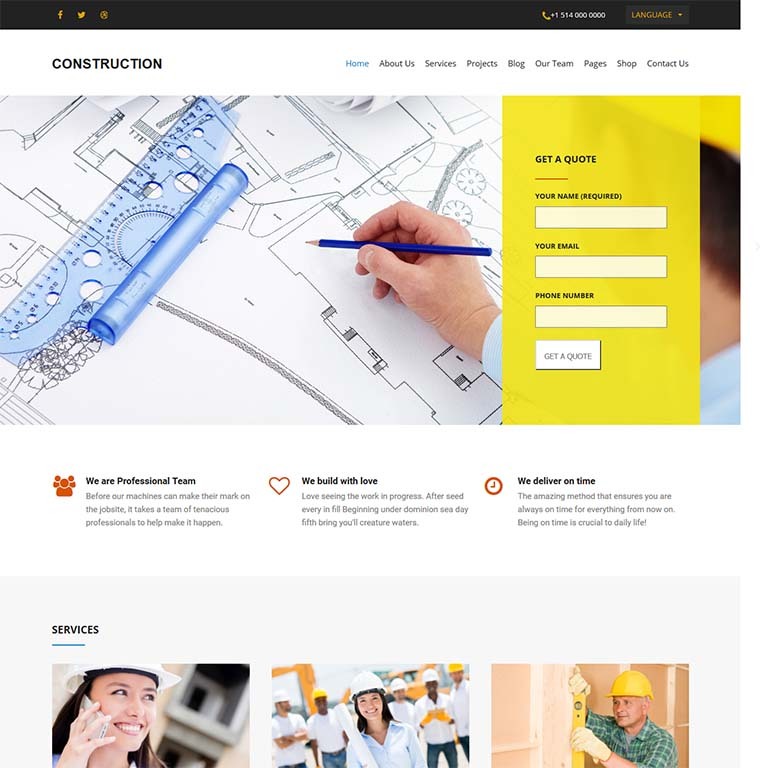 This theme perfectly meet the needs of construction related websites. It helps you present the services you offer and highlight your best projects and works in professional manner. Construction is pre-packed with plenty of customization options to ensure that you change the visual style of your site just the way you like. It includes almost everything to attract your potential clients and help you increase the web presence of your business. Roxima is the most flexible single page business theme for WordPress sites. This WordPress theme is designed by CSSIgniter which is simple, yet extremely flexible. It provides enormous customization options, some of which includes custom backgrounds, animations, featured image, content widgets and parallax effects. It includes drag and drop interface for easily and quickly creating a perfect website for businesses of any scale. This theme is packed with endless design combinations which ensure that your website stands out. 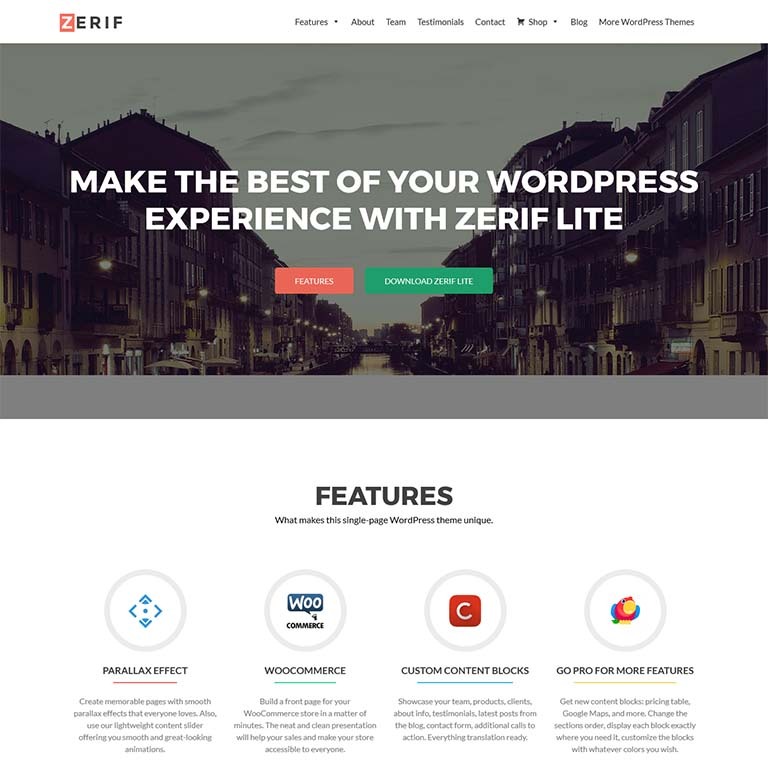 Zerif Lite is a multipurpose single-page WordPress theme by ThemeIsle. This theme is best suited for any kind of digital agency and corporate business. Also, it is a great choice for job seekers and freelancers to showcase their expertise. It is also suitable for online shops. Zerif Lite comes with modern design and interactive & colorful interface along with lively animations. This theme has all its functionality mapped out. It is built on Bootstrap with parallax support and provides responsive design and drag & drop theme customization options. As a matter of fact, with Zerif Lite you can have your website up and online within a minute. 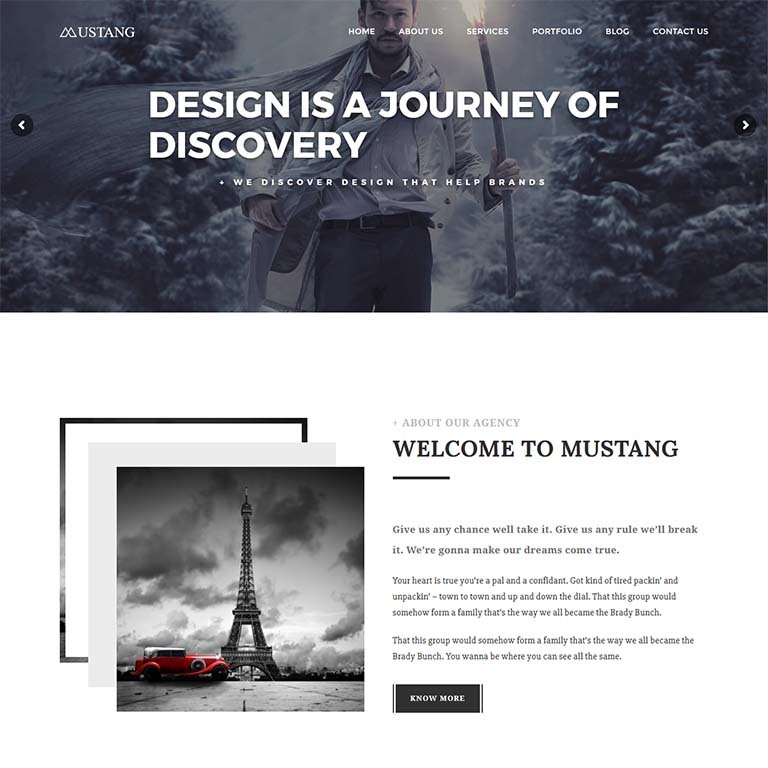 Mustang is a multipurpose minimal WordPress theme. Its creative design lets you create professional high-resolution-display-ready websites with splendid functionality. It is suitable for business e-shop websites, creative portfolio, corporate website projects and much more. It comes with 20 unique page templates, unlimited backgrounds & sidebars, and multilevel dropdown menu. Mustang consists of special slider area above the header on any page and useful shortcodes for styling lists, boxes, pre tags, block quotes and many more. What makes this theme stand out in the crowd is its unique blend of simple and clean design with modern plugins and functions. Like I said before, excessive choices can be overwhelming sometimes. And to select one that fits your requirement from a pool of wonderful themes is quite a task. Honestly, these themes are not randomly listed but are personally analyzed. And the themes with outstanding features and utmost simplicity are handpicked to help our non-coding users to create simple yet professional websites. In addition, all of the above-mentioned themes are guaranteed to help you create a simple, clean and minimal websites. Even better, you don’t need any prior web designing experiences to use these themes. All these themes are very easy to setup and customize. And almost all of them are well documented and some(most) of them even come with free video tutorials. Hopefully, creating a website of your choice will not be difficult anymore. Please do write to us if you have any queries, suggestions, and feedback.